uners are one accessory that has undergone some significant change in the last decade. Before tuning pedals were introduced, pitch pipes were used widely…though most of us just did our best to find an E and then use the “fifth fret trick” to get as close as we could. Now there are clip on tuners that use vibration to detect the tone and even guitars with fully automated electronic tuning where you don’t even need to touch the tuning pegs! 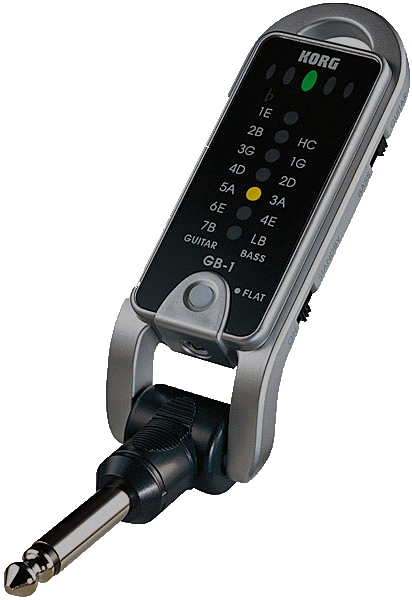 The Korg GB-1 (or Pitchjack as Korg call it) is a portable chromatic tuner that is simple to use, is cheap and has a few useful features. Unlike most clip on tuners which attach to the head of the guitar, the Korg Pitchjack has a built in jack so you actually plug it directly into your guitar. 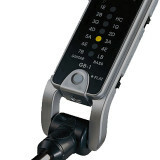 Now the main downside with this is that if you’re playing, you have to unplug your guitar to use the tuner. To use the GB-1, just plug directly into your guitar, switch it to “guitar” (or “bass”) using a little switch on the side and pick each note individually. The LEDs will tell you which string it thinks you’re playing and whether you’re sharp or flat. Just adjust the tuning until the LEDs tell you you’re in tune. The Pitchjack has some other features which aren’t as common on standard clip on tuners. You can tune, 6 or 7 string guitars as well as 4 or 6 string basses. The most useful of these features is definitely the downtune options. Simply press the light button and a little “b” appears indicating you’re in “flat mode”, then continue to press the light button and you can cycle through up to 7 semitones. Little LEDs turn on to show you how many semitones you’re set to. Then when you pick a string, it will guide you to reaching the flat tuning you’re after. Its pretty simple, and my regular clip on tuner does not have a “flat” setting, so I liked this. The Pitchjack runs on a commonly found CR2032 Lithium battery. As far as accuracy goes, I think the Korg GB-1 is very strong. One thing I liked is that there wasn’t constant jumping between being in tune, flat or sharp. The LEDs at the top light up cleanly and I found it easy to find the perfect pitch. I’ve found with some tuners (especially on multi-effect units) that you can be tuning sharp and flat for what seems an eternity before finally giving up and using your ear to find the right pitch. The accuracy, downtuning mode, quality construction and ease of use makes the Korg GB-1 Pitchjack are really useful tuner. The major downside is that you have to unplug to use it, so tuning in-between a song is difficult, let alone tuning during a song. Some guitarists may have no issue with this, however I feel it limits the Pitchjack to home use or tuning up before a performance. For many of us, this will never be a problem…and in that case, the Korg GB-1 does a great job.